Dad updated us last night and said it had certainly been a long, nauseous day. 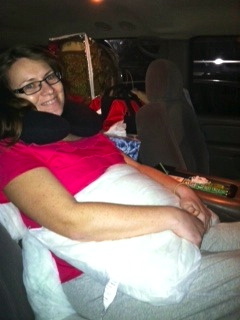 Kristi has been very restless and uncomfortable all day. The zofran is no longer working, and she had been getting relief from phenergan, but was finding no relief with it yesterday. We have all come to understand that when Kristi is very nauseated and trying to not get sick, she appears to have restless leg syndrome! She closes her eyes and shakes her right foot continuously. Dad said, she did that all day yesterday and was so tired, but unable to sleep because of how sick she felt. 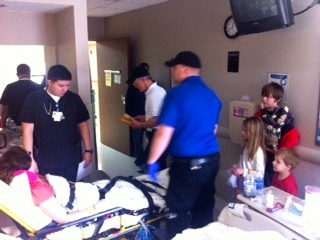 She was visited by several Dr.'s yesterday, including 2 infectious disease Dr.'s. One is the head of the department. He would like to work on the medications where she could go home on them, rather than be in long term care. He also communicated that sometimes if they can control the infection, the leaky intestine or fistula can heal itself without surgery. Please pray for this option!! Dad said they also communicated that if the infectious pocket (abscess) is too big, they may need to go in with a large needle and drain them. Their radiologist is going over the CT Scans from AR and will determine if they need to do more scans there. MDA scans take 450 picture slices compared to the 91 on the scan machine in Arkansas. So...MUCH more detailed equipment. Because of this, I bet she will need to do another scan once her stomach can possibly handle the drink. I'm sure they want to make sure it is safe for her body to do another scan as well. Dad said, "No big plans yet, just studying and putting the puzzle together. " I hate that Kristi has had such a miserable day, but on one hand, I am glad they are seeing some of her symptoms at their worst. This will help them move toward treatment more effectively and efficiently. 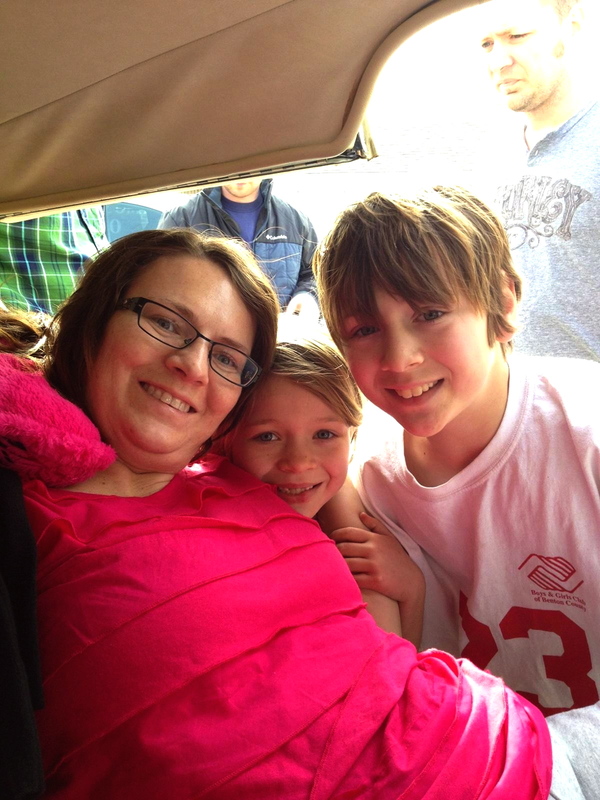 Continue to join us in praying for wisdom and understanding for those treating and caring for Kristina. I'll end this update with a text Dad sent to us all yesterday morning as he was boarding his flight to Houston. "Let's continue to tell the story for God's Glory even though we do not know the ending!! It is God's plan and God's purpose and we continue to walk by FAITH ALONE". Danina for the rest of us! 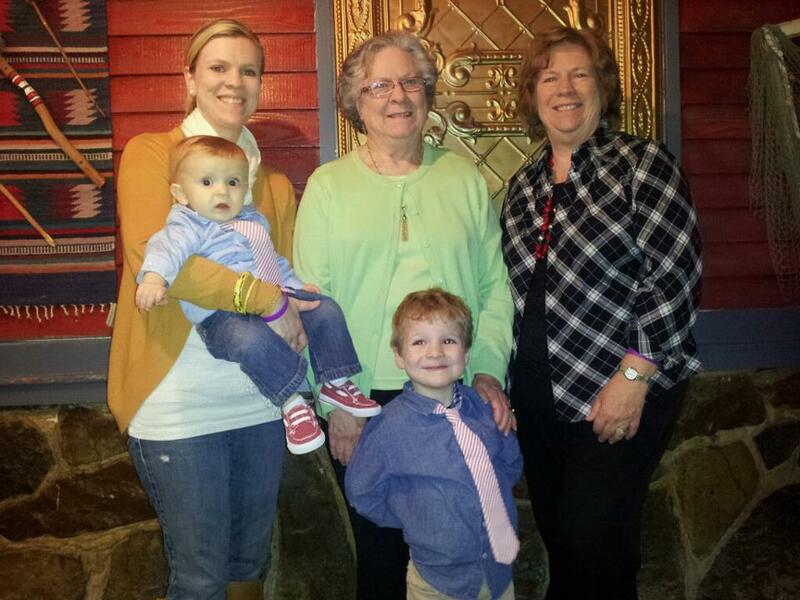 Four Generations with Katy's Kids! Kristi had a nurse come into her room and tell her she had been approved to be transported to MD Anderson with a Medical Professional to administer her medication. 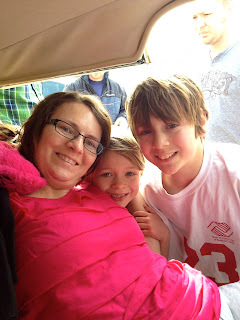 Kristi was surprised and explained that she had not even worked out transport yet and would need to call MDA to make sure she was admitted there. When she called MDA they said they had her pending, but would talk to the Dr.'s. She was told that she would need to go by ambulance with a nurse in order to skip the ER and be treated as a transfer patient from facility to facility. Then they proceeded to tell her that her insurance company said it would cost $5,600 and she would be required to pay that up front, and then they would reimburse her $1,000. 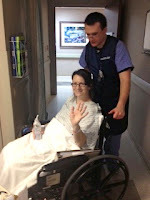 Kristi, quickly told the nurse we were going to work on another flight option as God had already provided a nurse who had volunteered her services to fly with Kristi to MDA as the medical professional and He had provided a flight before. Amy began, along with some others, working toward this flight. 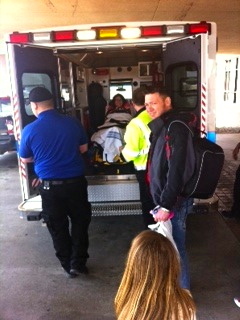 At 10a.m, we all got a text from Dad saying they were going to transfer Kristi by road ambulance within 2-3 hours. Wow... not enough notice!!! Kristi was told there were too many insurance problems and hospital policies to take a flight and if she rejected what they were offering it would cause many complications to her treatment and in the future with insurance. The rush and stress began!! Billy left right away to go get the kids out of school and get to the hospital to say goodbye. (The Hospital is about 40 min drive for everyone in the family from their homes). 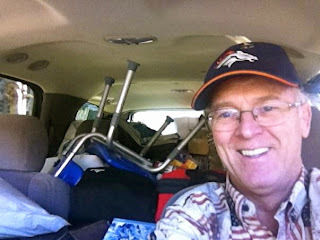 Dad and Katy began to try and get everything packed up for Kristi to take with her. 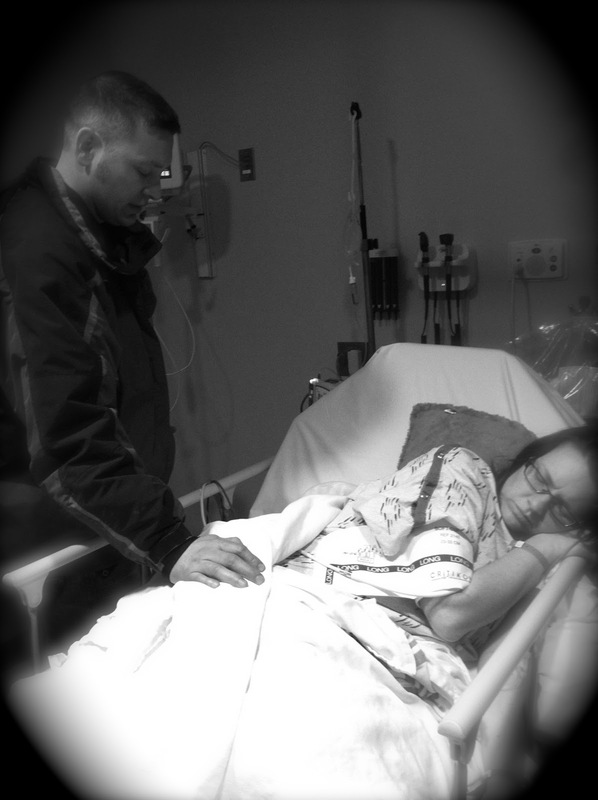 Josh went to the Hospital to say goodbye. The family began talking through if Dad needed to drive to Houston with her wheelchair and walker and other necessities or fly. Amy began looking at flights options for Dad to get quickly to Houston. We were all praying for Kristi. She was anxious. Billy was anxious! The kids would be anxious. We all felt anxious.... Back to Houston and who will go with Kristi? Who will stay with Billy to help with the kids since his job is from noon to 10, or 12 or sometimes 2 a.m.? Where will we stay, and should we drive or rent a car? ......and little time to figure it all out!! Most of all, back to living with so many unknowns and travel for everyone and their family being separated again. The unknowns medically.....What does this all mean, what will the Dr.'s at MDA find, will it require surgery again, will she be there long term or short term?? Whew....Stay focused ...........ONE DAY AT A TIME AGAIN!! 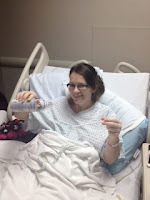 Kristi was loaded and given all the medication they could give her for nausea and pain via IV at the hospital. This would not be enough to last the 10 hour drive to Houston so we prayed against nausea and that God would put her to sleep most of the trip. God answered this pray and she was so grateful because riding that long on a gurney type bed strapped in and only able to lay on your back was not easy. They stopped one time and she was able to sit up and move around some. When she arrived at MDA they moved her to her same floor and she knew the night nurse. She said, "Welcome home Kristi, we will take good care of you!" Kristi was glad for the sleep all day because she had to do all the intake stuff and have numerous interruptions all night as a new patient. She said it was sad to say goodbye to Billy and the kids, but they are also SOOOO ready for her to do whatever is necessary for her to get well! It was hard for Billy to not be able to go with her, but he knows his Company has been more than generous already with his time and pay. Katy took the kids home with her for the day and they had a great fun afternoon together. A friend of the family is staying the nights at their house part of the week and Amy and Katy will help with the kids on the weekend. Billy and the kids watch as she is loaded! Dad flew out of Tulsa to Houston this morning at 8a.m. We have rented a car and nearby hotel room through next Wednesday and will determine what we need more in the days ahead. Amy and I are scheduled to fly down and relieve Dad next week if needed. 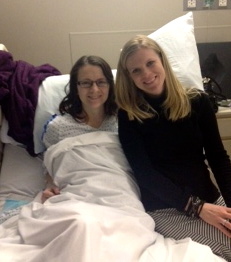 I spoke with Kristi a few minutes ago and she said she was doing okay, just struggling with so much nausea. This constant nausea is draining and she never feels like eating. She is mal-nutrioned and needs to eat. They are considering giving her a patch behind her ear or a different treatment to see if she can get some relief. Please pray they will get to the ROOT cause of her nausea and her infection. Treating the symptoms is not working. Pray that her infection stays contained by the medication and does not go systemic and septic. Kristi's primary Dr., Dr. Levenback, who has been talking with the infection disease Dr. in Arkansas, is out of town this week. However, her other two primary Dr.'s and surgeons are there. Pray for wisdom for all of them in the days ahead. We continue to ask God to close up any fistula so she will not have to go through surgery again. Jesus prayed this prayer over 2000 years ago this very week as he went to the cross. We have prayed this Scripture as a family from the beginning of this journey, and we continue to pray it. I told Kristi last Wednesday that God has seemed content to not remove her cup of suffering yet and am praying for His enabling for all of us to continue to live well with this suffering so that His Will will be accomplished and He will receive the Glory. Kristi wants this. 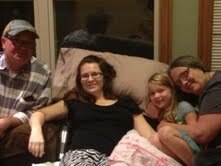 As Amy wrote earlier....Kristi is asking God to help her remain under this trial until God is finished with His work. The big picture is that Kristi will need to return to MD Anderson. Dr. Stillwell (the local infectious disease doctor) has worked steadily at trying to resolve Kristi's infection. In our naive non-medical minds we are trying to make since of all we've learned in the last couple days and I hopefully can make sense of it here for you. 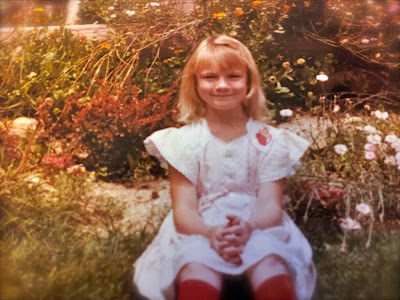 What we do know is that Dr. Stillwell feels like they are not equipped here to bring this to an end for Kristi and she needs to return to a place that fully understands her surgery and its aftermath. He explained to her last night that locally and at MD Anderson they have continued to grow the cultures that they've taken and multiple infections have shown up - Staph ( a non threatening type of staph, not MRSA) strep and posistive and negative rods as well as other types that I don't even know how to spell :) The abscess that they have located in her abdomen when she first came in to the Ark. Hospitial is shrinking so we do know that antibiotics are working there. However our bodies respond to an abscess by creating a capsule around it and the antibiotics work from the outside in, therefore the treatement is slow and the goal is to stay ahead of it so that it does not break free and go systemic throughout her body. At this time they feel like the antibiotics are working and staying ahead of the game. However due to all the bacterias/staph that is growing in her body it seems to indicate there is a fistula (hole in an organ) or leakage of some sort either in her GI tract or GYN tract. This does not show up on the scans and once again an area that Dr. Stillwell says they are not equipped to treat. MD Anderson will determine if there is a leakage and treatement would require surgery. Another scan they did this week as noted in an ealier post was to test the kidneys. On the CT Scan it showed that her right Kidney was enlarged. I guess a normal kidney clears in under ten minutes and Kristi's right cleared in 20 min. and her left in 34 minutes. This would indicate that the Left kidney was having to over work itself but yesterday showed that they were producing equally one at 51% and the other at 49% so this is a good sign and just something they will need to watch. At this point they will not put a tube in to drain the kidneys since they seem to be draining at equal rates. 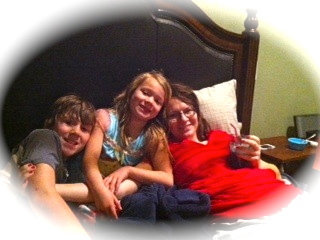 At this point we will wait through the weekend before we are able to set up her return to MD Anderson. She has been accepted to acute hospital care here which is due to the fact that she is on 4 different antibiotics and that is too much to go home with and expect home health to cover that for her. She will need to remain in the hospital for 5-6 weeks for the IV treatments. At this point we dont know if that means MD Anderson for that entire time frame or if she'll get returned home to this hospitals acute care floor. Recently I did a study on battling discouragement, the key ingredient being that we focus on God's Character and not on our circumstances. Kristi told me today she's focusing on staying under the trial God has for her instead of spending all her energy wishing it way. We celebrate that God is our Hope He is El Shaddia, the one who is all sufficient, He knows and Understands all things. As Isaiah 40 states He does not grow weary or tired (just we do) Yet He gives strength to the weary and those who HOPE IN HIM, the LORD will renew their strength... they will walk and not grow faint. So we "walk onward" one step at a time placing our Hope in His Understanding which we do not always Fathom. We do know that God continues to go before us and gives us the Strength for today and Hope for tomorrow. 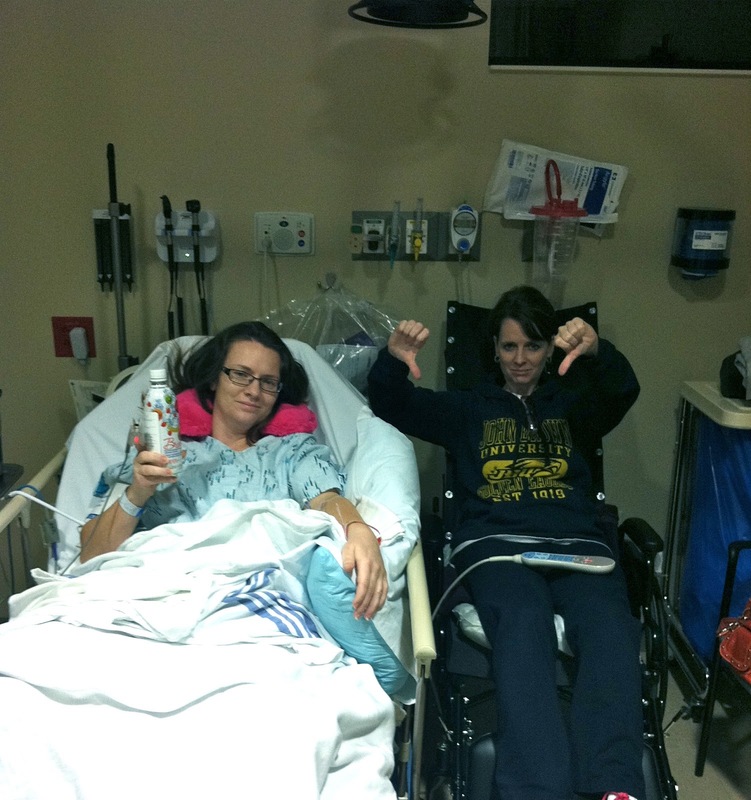 Kristi was able to drink enough of the contrast drink to get a good CT Scan. The scan did not reveal a bowel obstruction which is good news. They are hoping to compare it to the MDA scans to make certain. It did reveal that she still has an abscess in her abdomen, but the drain is in the right place for it to drain, and it has gone down in size. They also saw that she has an enlarged kidney and will have some further testing concerning this. They started her on two new types of antibiotics to see if the infection responds better to them. They are watching her nutrition and are concerned she may need to be given blood for anemia. They will determine this after today's blood tests. She still has bouts of nausea with her food intake. Kristi is growing very weary of being in the hospital, but doesn't want to go home without the infection being clear, or knowing she is on the right medication. Yesterday they inserted a pic line into her arm for the medication and to continue to do the blood draws because her veins were not continuing to be able to handle all the antibiotics via her IV. 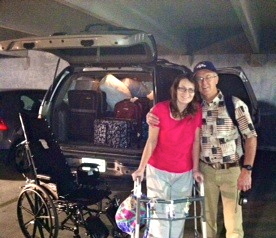 Please pray that the AR Dr.'s and the MDA Dr.'s will be able to communicate and transfer records for comparison. Pray for wisdom for them and that Kristi will be able to eat and nourish her body. Isaiah and Alyssa are having a fun spring break with their grandparents, great grandmother, and with some sleepovers or play-dates at some neighbors and friends. Thanks to all for helping them through this spring break. One day begins to roll into the next when you spend days on end laying in a hospital bed. Kristi says she loses track of what day it is. Each day carries new ups and downs of its own. We all find ourselves longing to make sense of the tid bits of news we get from each doctor or nurse who comes to care for her and often times that changes with each visit. Todays Jesus Calling was very fitting when it said "Dont let your need to Understand distract you from My presence. I will equip you to get through THIS day victoriously as you live in deep dependence on Me"
We are all learning to take one day at a time and Lean not on our own understandings but wait on God and His perfect timing. Today Kacey and I (Amy) were able to spend the afternoon with Kristi before taking off for a few days to Colorado. As I think about our mini vacation I long for Kristi to have a mini vacation from her long days. I told her I wish I could just take her with me so she could stare out the windows and look at new scenery plus to all of us Colorado is the Home of our Hearts and we feel at rest there. There is a peace that settles over you to be in the majestic mountain ranges and watch the snow falling. Theres a lot to say for new scenery and we pray that Kristi will soon get to go home - that will bring new Hope and rest for her soul. For today Kristi had a mini vacation from her hospital bed into the CT Scan - not so fun and often she has to find the happy place in her head as this is the 4th CT scan in less than a month. The scan will look once again for fluid build up, air pockets, and obstructions. She persevered in drinking the contrast - thats the part she dreads the most and got accolades from her nurse at how well she did. Today we also found out that her cortisol which they thought was low is normal. So its down to this CT Scan and finding the correct antibiotic to clear up the infection. As we were leaving today they were putting a pic line in. This will help a lot as she is getting bruises everywhere from all the places she's been poked to take blood each day. This will also allow her to go home with IV medication once they figure out which antibiotic the bacterial infections respond too. She still battles nausea but seems to bounce back from it quicker. Small changes are BIG Celebrations at his stage of the game. She was even able to sit up in a regular wheel chair for her ride to the Scan. So now we wait - once again! I told Kacey to bring a book along because on some days we spend a whole lot of time just "waiting" She entertained Kristi and I at times by updating us on her book, it's had her in tears and suspense. Thank you for waiting with us and filling in the gaps with your prayers. Kristi told her community pastor today that your prayers were the greatest gift because she finds at times her brain is so weary she can't even pray for herself. We thank you for being faithful that when the Holy Spirit nudges you to pray, you are obedient. Kristi often finds that when she's getting anxious or discouraged those feelings dont take up residence in her heart and she knows its because someone out there has sought God on her behalf. When you face the perils of weariness, carelessness, and confusion, don't pray for an easier life. is to her full recovery. Kristi had a better day yesterday. 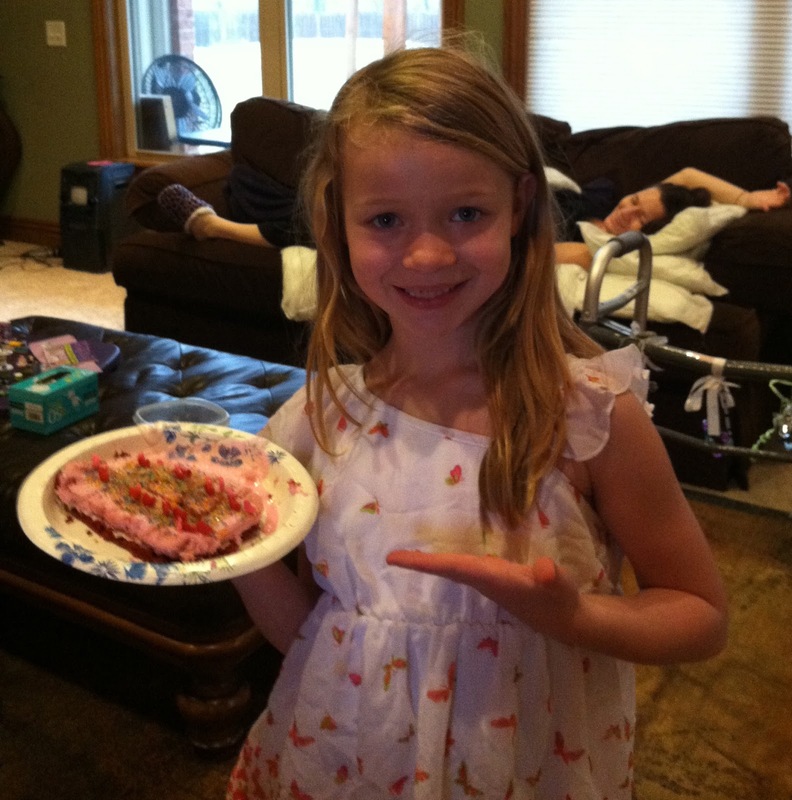 She was able to eat without nausea and pain, did well with physical therapy, and looked and interacted better. 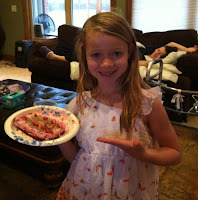 However, today she did not feel as well, and was getting sick again after eating lunch and overall did not feel well. It is hard to not become discouraged because there do not seem to be clear answers or solutions to some of these symptoms. The fluid coming from her drain tube continues to look infected even while on 4 antibiotics. Please pray for Dr. Stillwell, the infectious disease Dr., who is working very diligently and thoroughly to determine what medication is needed to treat Kristi. He has found that two bacteria growing in her cultures are resistant to Levaquin which is what she was taking when she left MDA after her previous infection. Her internal Medicine Dr. Davila, and Dr. Ivy, the Gyn Oncologist, are also working with the Dr.'s and MDA to care for Kristi. They will not release her from the hospital until she is able to eat and receive nourishment without the pain, nausea and vomiting, as well as, understanding the infection. They would like to do another CT Scan on Monday if her body can handle it. Pray that she can drink enough of the contrast liquid for the scan to reveal any problems. Monday night she was too nauseated to drink it all which weakens the contrast in the picture. 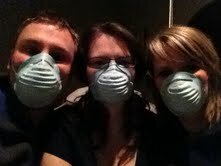 Please pray for wisdom for these Dr.'s as Kristi's case is somewhat unfamiliar to them on many levels. Pray for wisdom for the MDA Dr.'s as they consult from a distance. Yesterday, I had a good day with her until I left at 2:30 to be home for Isaiah and Alyssa. She also enjoyed a visit from Billy before work, and then Dad, Mom and Josh as they helped her take her evening walk. 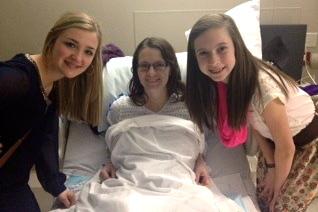 She was later surprised with a visit when Katy went on a date with her nieces and stopped by to cheer Kristi! 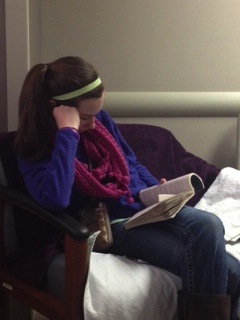 She was even for the first time thinking she felt up to seeing some extra visitors and felt good enough to watch t.v. without feeling sick. But today, it was back to a hard day. We are all so sad for her and wait with her for answers and relief. 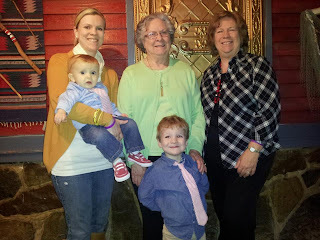 Mom and Grandma arrived to take over for Danina and Elise. for Spring Break and Kristi at the Hospital. being in two different places. It is always so hard for any of us to leave Kristi, Billy and now the kids. the song Blessings in Disguise came on. I love this song anyway, but it sure made me cry today!! Click on the picture below if you haven't heard it or want to hear it again! What if Trials of this life are God's Mercies in Disguise. I'm grateful this world is not our home! through this suffering Kristina, Billy, and Kids!! 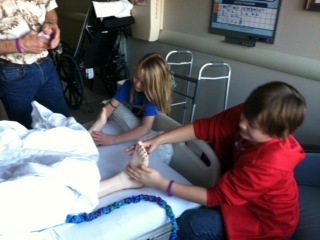 It was so nice to be able to take Isaiah and Alyssa to see their Mom at the hospital. It alleviated their anxiety to go see her and know she wasn't "Clear in Texas"...as Alyssa would say it! course did a great foot massage! Week one is Complete! She's been home for seven days and it's been fairly uneventful. We've spent time getting in to a rythym at home. Its taken a number of us to care for her this week as we are trying to find the balance between caring for her and our own homes, lives, and jobs. Billy has been great at taking the night shift after returning home from work around midnight and on through until he leaves again for work the next day at 11am. The rest of us have taken our shifts in and out of the home to provide for her daily needs. Leona returned for the week to help care for the kids and was a great caretaker assistant to help out when we needed extra hands with Kristi. 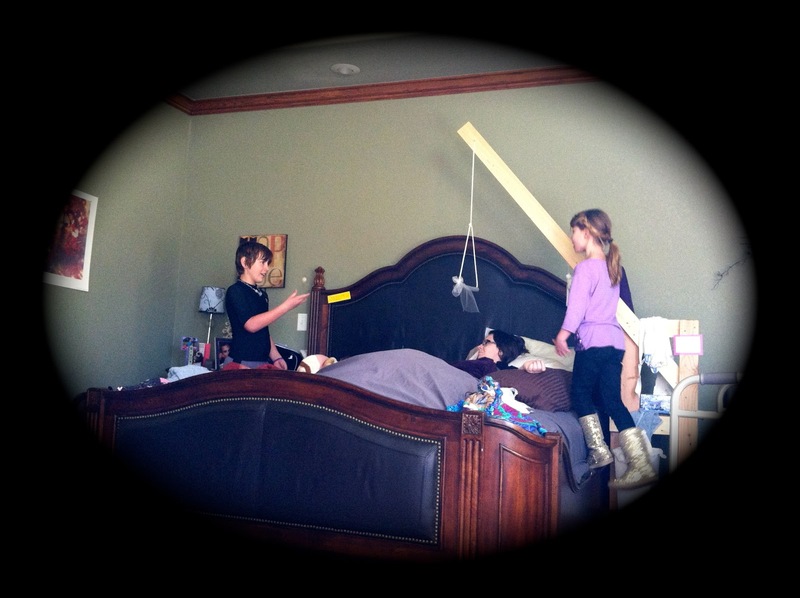 Home health and PT came once this week to do an evaluation on how to care for Kristi. This is a prayer need that her insurance will cover all that she needs and that the home health service we've chosen will be a good fit for her. - Another challenge this week has been getting enough nutrients in her. She is good to drink her ensure and glycerna drinks to get the nutrients its just that her intake is very minimal maybe drinking one a day over a period of time. She was able to talk to Dr. Levenback on Friday who said we will not know if her small intestine has come un-kinked so she can begin to add others foods in and see how she does. When I left her today she was battling some pain and nausea and she truly didn't add much back in so that feels a little discouraging. Other areas of concern this week has been that her pelvic drain has changed in color and consistency as well as volume. The doctors had hoped that it would begin to drop to about 10ml and we would be able to remove it but nsteaid of decreasing it is increasing by quite a bit. 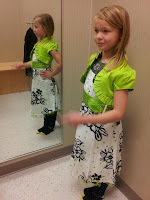 She will try to see a local Gynecology Oncologist this week to see if we can get some answers to that. Please pray with us that she'll be able to get in soon and that the drive there will not be a set back for her. Katy experienced an adrenaline rush giving her first shot! Joshua was glad she agreed to do it since neither one of them like needles! Katy decided she might like to do that more often! Do to the stinky pevlic drain we have all decided to done our pretty nursing masks when taking care of some of Kristi's needs! They are our latest fashion statement. As the week progressed on Kristi was able to leave her bed some and sit at the couch for an hour and last Thursday when it was so beautiful she chose to sit outside and watch dad and Isaiah shoot baskets. Danina and Elise arrived last night to take Week Two shift! Yesterday I (Amy) had the Honor of escorting Kristi home. As Danina mentioned the day started off with an array of emtions for all of us. As I awoke I felt the overwhelming sense of joy at getting to board a plane that God had provided just two days ago, yet I also had an irrational fear of this plane crashing! I certainly recognized this as Satans tactic to rob me of my joy and asked my husband to pray with me and over me. At the conclusion of our prayer Rory Hosteter the pilot called to tell me we needed to take the smaller plane! Oh MY! I told myself "Here we Go Jesus!" You, me and Rory, and a good dose of Dramamine due to the fact that turbulence has a way of making me nauseous real quickly! Rory himself was a gift to me as I know he and his wife personally, and have had the privilege of flying with him in the past - God knows about all things because two days earlier when we were attempting to connect with an Angel Flight pilot a sequence of events and phone calls led us to Rory and he was available. Thank you Jesus for that gift to me and to our Family - I found myself from here on out being Grateful! Grateful for the honor to fly with Kristi on her trip back home, grateful for a small plane that worked far better than even the bigger one in getting Kristi in and out of the plane with ease, grateful for sunny skies, grateful for a mainly smooth flight and for dramamine when it was turbulent, grateful that all my fears vanished after the gift of prayer with my husband. Grateful that God cares about all details. He took care of the right plane, the right pilot, sleep for Kristi on the flight home, and even a hug for my mom! That morning my mom was struggeling being at home and not apart of either end of this trip with Kristi and told dad she needed a hug and he wished he could give it to her. He prayed before leaving the apartment that God would show his love to her on that day. That morning at church a young man came and gave mom a giant Hug and told her he felt she needed a Hug today! God cares about all the details! We arrived back in Arkansas safely! and I had the joy of escorting Kristi through her first night and day at home. We were nervous about how this day would unfold since it took her a couple days to recover from her day long visit last Wednesday to MD Anderson for follow up appointments. What we've all found along the way is that when we are with Kristi there is a sense of Peace that comes with that and it feels very natural to work alongside her to care for her needs. We rolled into the normal rythym of taking care of her night time needs and we both crawled into bed being grateful that we were "home"! Today she awoke with antsy legs and tendon pain, all things we feel are due to the medication she is on, but she also awoke with a smile.... something all of us have come to appreciate through this journey with her. Pain and trials can rob us of a lot of things, but it doesn't have to have the power to rob us of our smile or the inner peace that comes from Christ alone. We moved on through the day at a comfortable pace of taking care of drains, medicine, baths, walking, phone calls to home health care, rubbing legs and applying ice packs. It felt right to see Kristi standing at her own sink today. This was her exercise for the morning to walk to the sink to brush her teeth and wash her face. Something she has not done for five weeks since leaving home. Just getting to brush your teeth at the sink and not in cup at your bed is a gift. So many things we take for granted that she is gaining a whole new perspective about, as are we, as we walk beside her. All in all today was a Good Day to be at Home, physically and emotionally. To be at rest in this place and at this time on the road to recovery. As I left today I passed the baton of care to Terrie, a friend of Kristi's from the cancer posse. Thank you Terrie for filling the gap between myself and Katy, Josh and Dad as they arrive this evening to do their part of taking care of Kristi while Billy is gone to work. I sure find myself often counting my blessings for this large team of care takers and that mom and dad decided years ago to birth themselves a basketball team worth of kids and to teach us the importance of making assists to one another in the game of life. and all mixed with a deep Gratefulness! and side effects to medication. The 20 min car ride to the airport confirmed how much we needed a plane ride to Arkansas! to the plane ride, but then was able to go to sleep. to see each other when her plane landed. 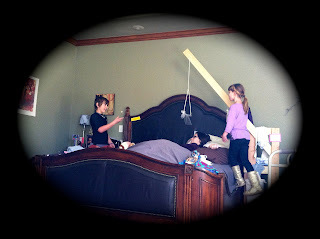 It was a happy, but quiet reunion as the reality of the situation was a lot to take in for the kids and Kristi was exhausted and not feeling well. 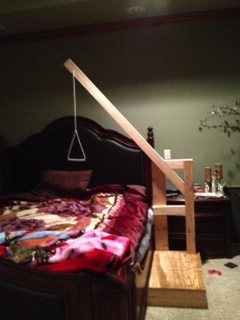 this to help her move while in bed and get in and out more easily. Settled at home! Thank you LORD!! Kristi from any further complications and to guard against infection. Praying her obstruction in the small intestine resolves itself and that the fluid in her abdomen will continue to decrease. Praying she can rest and heal and feel well enough to eat and hydrate as needed. We have a schedule for the month of March for Care Taking Organized. Kristi says she is like taking care of a newborn baby around the clock...and that really is a little of what it is like! I'm sure glad she can communicate and tell us what she needs ....unlike a newborn!! I told her yesterday as I was getting her ready to go to the plane that she was such a good patient. She always remains kind and appreciative even when in great pain and misery. We have been busy packing up the apartment and getting Kristi ready to go home today. She is anxious about the travel and the transition away from her Dr.'s and this controlled environment, but also looking forward to it. Seeing her children and having her family back together will help in her recovery! Dad was singing yesterday, "One "Moment" at a Time" because everything all day kept changing quickly with her home health care and travel. 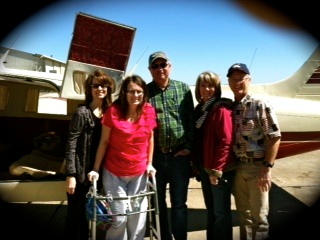 Amy is now flying down with the pilot and we will meet her at the plane to get Kristi settled at Houston Hobby. She will fly back with Kristi and I will get on a plane at 2:30 at Houston Hobby to return home. 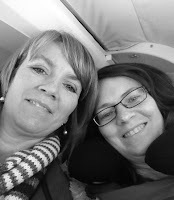 God provided for me a flight home on short notice through a cancer survivor friend of Kristi's. Thank you!!! Dad will start driving after he is finishes loading the car. Pray for safety for all of us in travel as we are tired and there are a few unknowns...as always these days!! Pray also for Kristi with her medication. She has been having some very uncomfortable side effects from medication and we are trying to change some of that, but change also brings other side effects. Isaiah and Alyssa are extremely excited! Pray Kristi feels well and has the energy after her travel to interact and enjoy them. She is usually not in great shape after she has been upright and moving for a long period of time. Thanks to those of you who have the house clean and disinfected and her specific food needs all in place as she returns! You are AWESOME!! Thank you to the Elders of her church and the many others that are specifically praying today. Thank you for trading cars with Billy so Kristi's travel can be easier once in Arkansas. So many little details and God cares about each one...and so do you..... her cherished family, friends and prayer warriors. Pray God will take all of her anxious thoughts captive! !